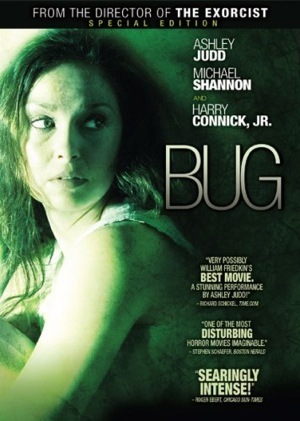 Bug literally crawls under your skin and takes hold of your mind as you figure out what is it about this film. This dim setting is not likable or relatable. At first, it just pricks you, then it burrows.This woman is so lonely that she asks a Gulf War veteran [Michael Shannon] she just met to stay with her? Are we to believe this? Turns out he spent years in a hospital [in the mental ward of course] and believes he was tested on. The acting and story makes it credible and the film quickly turns into a paranoid vision of terror and oblivion. The sighting of a bug turns into a big cover-up, an issue of trust or consequences and a genuine fear. It connects bugs to the CIA, the military, Unabomber Ted Kaczynski, Oklahoma City bomber Timothy McVeigh and Jim Jones Temple’s People! Sometimes funny and sometimes downright creepy and bizarre, Bug is not a film for everyone (the other two people in the theater with me did not like it). I laughed out loud at the absurdity and cringed at the possibilities. It is that effective and completely original. And Ashley Judd. I don’t know what to say about this phenomenal actor. I love every film she does, every role she takes. She would be a dream to interview. This gorgeous, self-assured woman is able to become the most desperate of characters [please put Come Early Morning on your netflix queue]. She delves in and does not let go. She embodies this icky, questionable woman and makes her complex and layered. Aggie is a survivor. It is not that Bug is super deep or philosophic or existential. At the beginning I was even thinking “what is going on?” and then bang! It blows up and out and over and it’s fantastic. Bug is just a satisfyingly good psychological thriller. In Half Nelson, first time feature film director Ryan Fleck presents a metaphor for life’s challenges. This wrestling hold puts you in a compromised position and it is difficult to release from it. A drug-addicted junior high school teacher (a subtle and focused Ryan Gosling) forms a strong friendship with one of his students, Drey (Shareeka Epps). The end result is a somber yet realistic story. In this role, the talented Gosling (The Notebook, The United States of Leland) turns in a quietly moving, haunting, riveting performance as this intelligent teacher who finds himself stagnated and questioning his impact on society. It is entirely relatable. Who has not felt that way at one point? Why do I do this job? Do I matter as one individual in the overall schematics of the world? Everyone else seems to be moving along, as one should. People seem happy, settled, and comfortable. The inner-city characters are real. He plans to write a book but never gets around to starting it. His ex-girlfriend is engaged. His parents reminisce about their glory days protesting Vietnam and other issues of the 60s. During a family dinner, the mom even puts on “Free to Be You and Me” while getting drunk and dancing around with her sons. Even his students are more focused than him. Drey learns of his secret double life and forms an alliance. She’s wise beyond her years, being a latch key kid and having an older brother in lock-up. Epps makes a solid, innately natural first-time acting debut. Fleck interposes quiet moments with quick hand-held camera shots to weave the story. His directorial approach is entirely effective as the ending is left open, allowing filmgoers to leave the theatre in deep thought or in intense conversation regarding the numerous provocative elements within the film-Dan faces the difficulties of making a difference, of advancing one’s life and of doing enough. Dan is a fully functional crackhead, has a novel teaching approach and is a favorite among his pupils. Yet he has many dark, insular days and darker nights. He is a troubled soul that cannot often get out of his own mind or change the sheets on the bed. 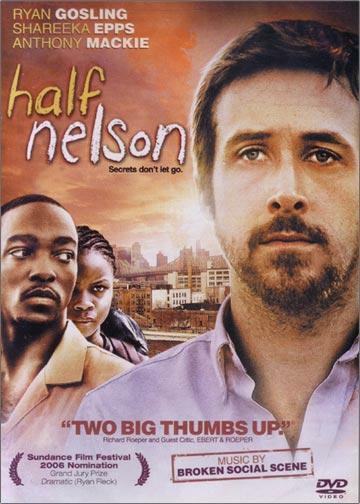 Half Nelson starts slow but is gritty and honest in its portrayal of a flawed individual who strives toward living the good life. This entry was posted on August 28, 2010, 00:07 and is filed under DVD. You can follow any responses to this entry through RSS 2.0. Both comments and pings are currently closed.